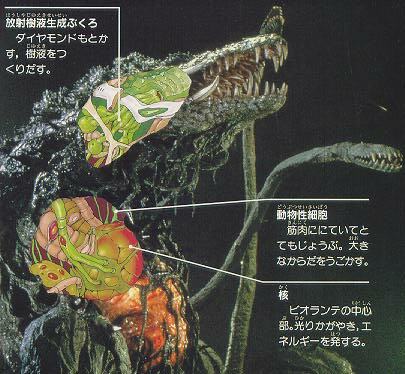 Kaiju-Biology or "Why wasn't Bio this fun in school?" It would be impossible to list all the great advances made in Kaiju-Biology over the last 10 years on this WWW page, but hopefully this will give you a flavor of this unique field of research. Employment opportunities in Kaiju-Biology are expected to continue their current increase into the near future so study hard and someday you may be Godzilla's greatest enemy! Godzilla is perhaps the best known representative from this category. An understanding of Godzilla's biology is considered by many in the field to be crucial in developing a firm foundation for the science. Most of the current research efforts are geared towards a better understanding of Godzilla's digestion system which appears to provide him with energy from nuclear materials with little nuclear waste. An understanding of this process could revolutionize the world! Of course, there is also much military research geared towards the production of a Godzilla-breath-like weapon. Such a weapon would have fantastic destructive capabilities that could strike targets much faster and cheaper than conventional projectile type weapons such as bombs and missles. 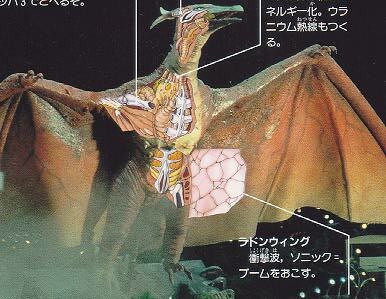 Flying monsters, such as Rodan and Battra, pose a baffling question for aerodynamicists: how do such large, heavy creatures stay aloft? Birds are known to have very light, hollow bones and efficient wing motion so they can generate enough lift to overcome the force of gravity. 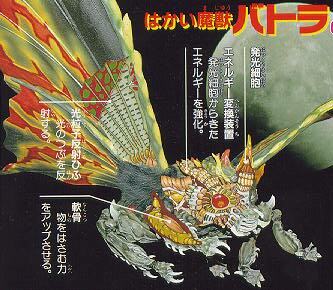 Flying monsters, however, cannot have light, frail bones because they oftentimes attack by ramming their opponents. It is theorized that they overcome the large gravity force acting on them by generating some kind of gravity field about themselves helping to reduce the overall downward force. The wings are then primarily for navigation and generating forward thrust rather than lift. Many aircraft manufacturers are also interested in how these creatures attain supersonic speeds (greater than Mach 1) with relative ease. Man-made supersonic aircraft can achieve large speeds but usually pay a large penalty in fuel consumption. A better understanding of these monsters could help produce a better version of the SST aircraft someday. Biollante is the main monster in this category but SpaceGodzilla can also be considered a further mutation of Biollante due to interactions with stellar media. Biollante's creation was a mistake and researchers are still having difficulty understanding how the amalgamation of Godzilla, rose and human DNA created such an effective monster. It's ability to seemingly disintegrate and reappear in a new form fascinates physicists who are interested in seeing if such a "matter to energy to matter" transformation could be achieved where the final material state is exactly the same as the previous state rather than a mutation. Such a process would pave the way for an exciting new means of transportation: teleportation, which would render all other forms obsolete! Although "Beam me up, Scotty" is a common joke in our day, our descendents may be using a similar device to get to and from work -- no more traffic jams! Biollante, however, has become somewhat of an easy target for protestors of genetic energineering and has caused this research to be surrounded by controversy. Research on monsters in the Cyborg class has obvious applications to robotics but many other fields can benefit as well. 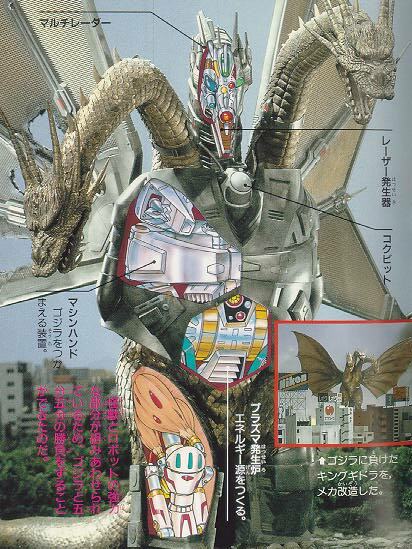 Computation and Neural Systems specialists are interested in how monsters like Gigan can "think" and operate its biological and cybernetic parts in tandem. The high speed space flight abilities of Gigan may someday allow humans too explore worlds to far away for conventional space technology. The ability to graft robotic parts onto muscle as in the futuristic cyborg Mecha King Ghidora (see cut-away view of leg) could provide high quality artifical limbs for those who have been seriously injured in accidents. 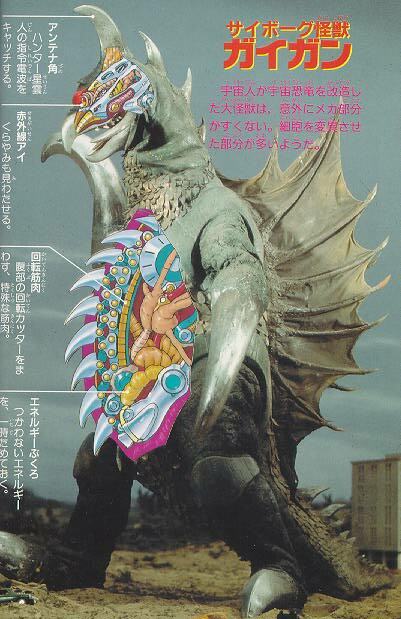 Gigan was designed as a war cyborg capable of self-sufficiency. Again, researchers are interested in the digestive system of Gigan to determine if a method of deriving energy from readily available raw material could be indentified and implemented on earth. These and many other questions surround the new field of Kaiju-Biology. Few fields of science offer such exciting possibilities for the future of mankind! Currently, most of the best research in this field comes from Japan but as time progresses, universities in the West can be expected to follow suit. Back to Alan's Kaiju page!